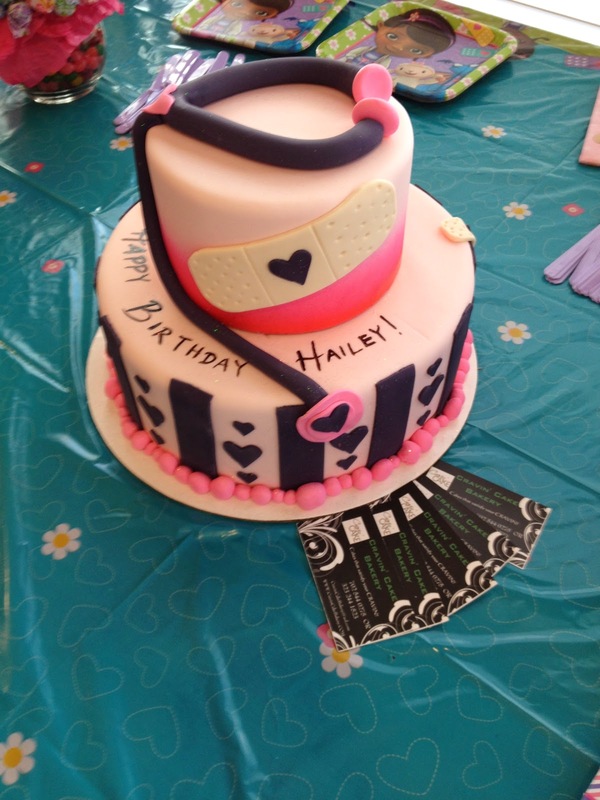 Hugs for Hailey: Birthday Party Recap! **CAUTION** This post is picture HEAVY!!! 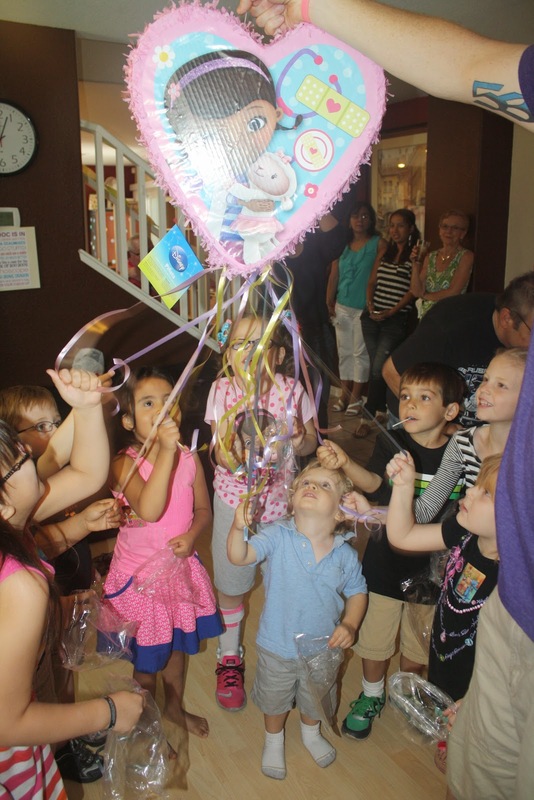 When Hailey finally decided what kind of birthday party she wanted we got into full party mode here. A special thanks to Believing in Bryleigh and Lexi Jayne Designs for helping us with all the paper decorations and invitations!! The invitations could not have been cuter! Thank you Tiffany! The banner was the perfect size! I did get some party hats and plates and napkins with Doc McStuffins on it to spruce up our table, which was the center piece to the party. Hailey loves a party hat! 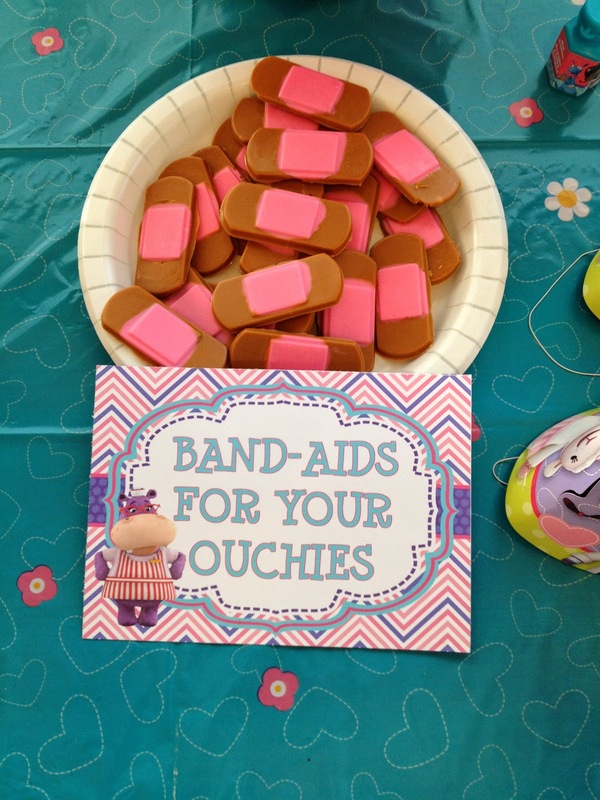 There are TONS of ideas on Pinterest for a Doc Party! I loved all the ideas posted that I pretty much duplicated everything I saw! I couldn't help myself! I set everything up the night before when Hailey went to sleep. There would be no time in the morning to do so. We were up early and out of the house for Horse Therapy at Spirit. Who doesn't LOVE polka dots!? 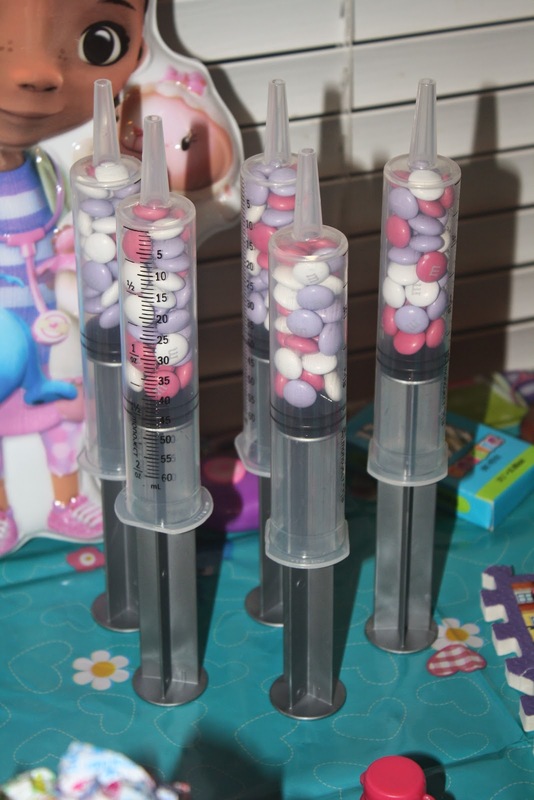 I took some of Hailey's 60ml Syringes and filled them with Colored M&Ms that Hailey's Grandma Dinah gave us. It helps make those big syringes not so scary and every kid wanted one! 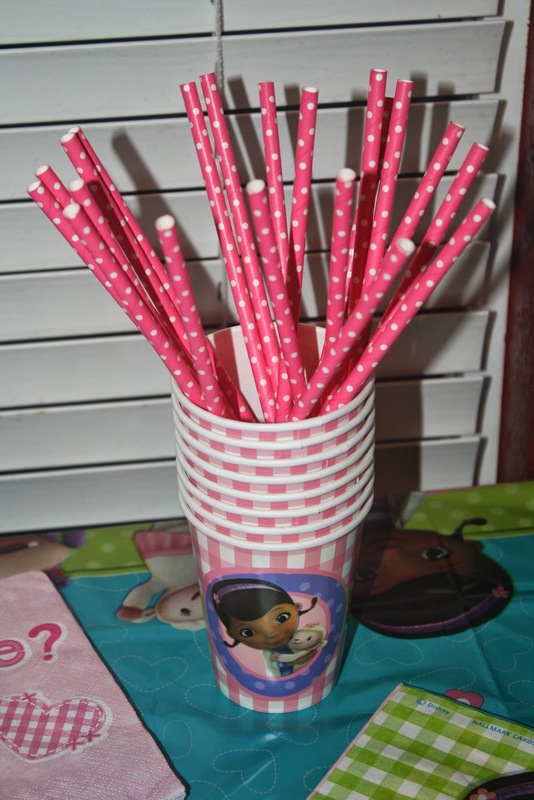 I also filled these little test tubes with candy and m&m's. 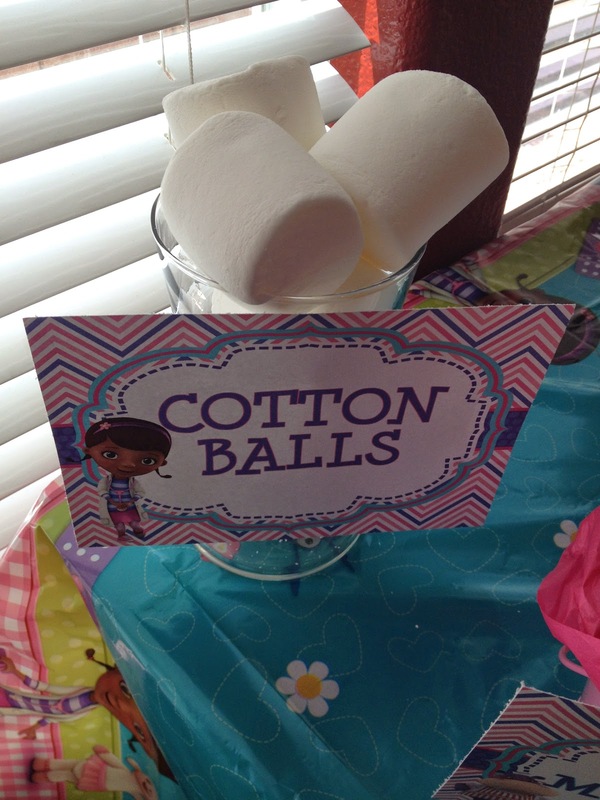 Our centerpieces were made from glass bowl, jelly beans and floral foam from the dollar store and of course Dum Dums. EASY! Tiffany at Lexi Jayne also made these great cupcake toppers! PERFECT!! I saw this idea and knew I HAD to do it. I took empty push pop containers and filled them with cotton candy and called it "Extra Fluff" After all, if you are a doctor for stuffed toys you are going to need extra fluff for your patients. 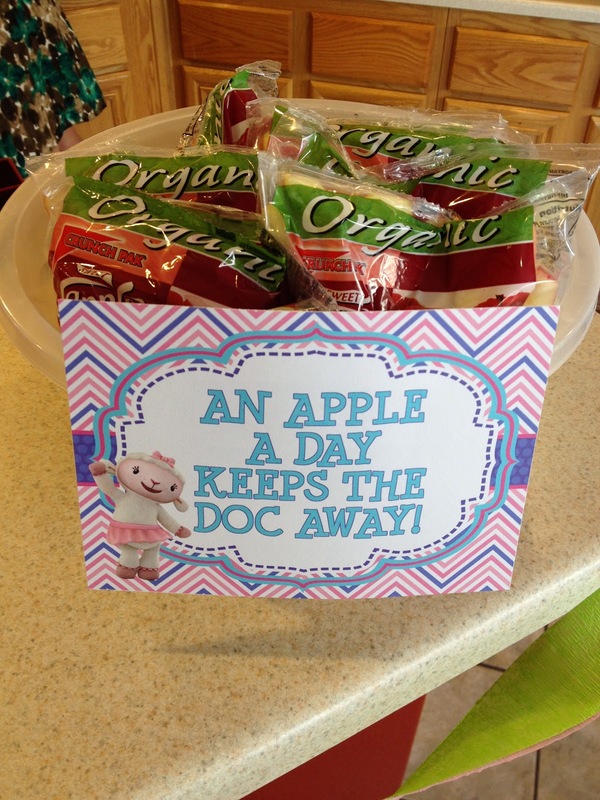 An apple a day keeps the Doc away! An easy way to incorporate fruits for the kids! Water just looks more fun with water bottle wraps from Lexi Jayne! You can't have a party without cake! Read about our cake story HERE!! I set up an activity table for the kids that were coming. Everything was set up and ready to go when the kids arrived. We had all of Hailey's favorite things, coloring, band-aids, stickers, and arts and crafts! Hailey was having a blast with all her friends! This was my version of the Big Book of Boo Boos. I got the note books and crayons also at the dollar store! Hailey's dad ALWAYS gets on me for my take home goodie bags. He does NOT think I should make goodie bags for the kids since they didn't do that when he was growing up it didn't make sense to him, but I did it any way!! The girls took home their own Dr.s bag filled with Doc toys and stickers. It was ADORABLE!! I ordered these online at a half price party supply website! These are some Tootsie pops and some Lambie lollipops. Hailey's favorite! I even set up a photo booth for pictures. By Photo Booth I mean that I put this on the wall and I took pictures of the kiddos that came! LOL! 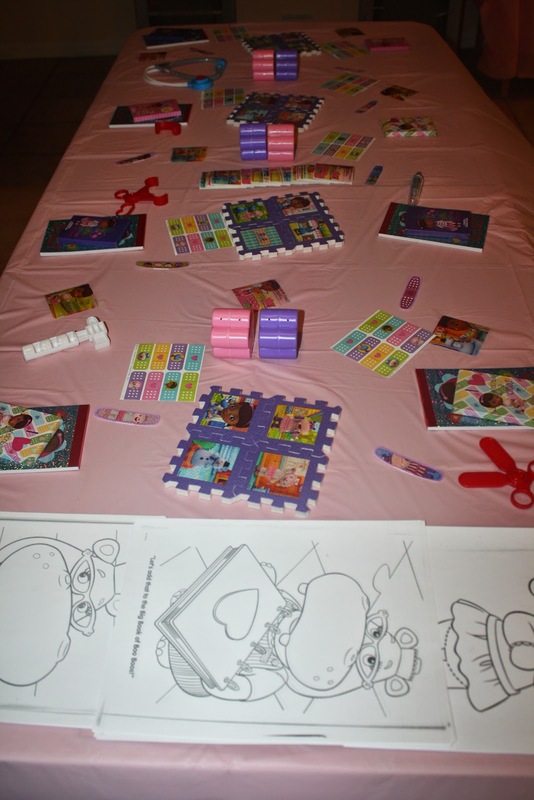 I loved that the kids enjoyed the table, just in case I also put on a Doc McStuffins movie. I also had make your own necklace craft going on. Can't miss out on an opportunity for some OT! So instead of each kid taking a turn to whack at this beautiful piñata this was a pull string piñata. Great for kids with special needs and for toddlers! Each child takes turns pulling their string until the lucky person with the "magic" ribbon pulls and the bottom falls out and candy spills! It was great and no injuries! Time for cake! I can't even count how many times we've sang Happy Birthday to Hailey that week. I think once with every meal and she LOVED it! Thank you again to everyone who sent a gift off of Hailey's Amazon Wish list, or mailed a gift! We appreciate your generousity SO much!! We are grateful for your friendship! Hailey enjoyed everything! Before Hailey's party I had wondered what Hailey would like for her birthday as a gift from mom and dad. One day she was on her iPad and she was watching a youtube video of 2 little girls playing with Frozen dolls. Hailey had told me that she was going to get those dolls for her birthday and then it hit me that I should go pick up these dolls from the Disney Store. I had seen them before our Make a Wish anniversary trip to Disneyland and I also saw them at Downtown Disney when we went. I didn't buy them then because I knew they were in Vegas. I tell Josh we should head out and pick them up because Hailey would really enjoy these dolls and she watches that video on loop. You have all heard of her love for Frozen and how she watches and SINGS the songs all the time. We head out to the first store and they are SOLD OUT. Second store SOLD OUT. Third store SOLD OUT. I'm sensing a pattern...Turns out these dolls are SOLD OUT across the United states! I could find them on Ebay for 3x's the price, but that wasn't going to happen. I even had employees I knew that worked in the parks looks for them and NO luck. I had people all over the country looking for these dolls. I had a feeling I wouldn't be able to get these dolls for my daughter. I was going to be a failure as a mother. They were also going to release some Frozen Dresses but you had to put your name in a raffle for the opportunity to buy it and that was to nerve wreaking so I passed on that. It was time for the store to open and they had said that the place you are in line outside the store is the place you'd be at the registers! I was so happy! I was going to be able to get these dolls for Hailey!! Happy Day! First up is Anna!! I wish I had a video going. When Hailey unwrapped the box and saw Anna she said, "Oh my GOSH!!!!" it was adorable! It was a great party! Great friends and family who traveled for hours to get here! I find these birthday's SO special and I love to go above and beyond. Thank you to everyone who contributed their time and their talent into helping me make this party perfect. Thank you to everyone who cooked, helped clean up, and to everyone who sent birthday wishes on Facebook! Happy 6th Birthday Hailey!! Until next year!! We love you! !